This is an excellent introduction to the life of Imam Abū Ḥanīfah Nu'mān ibn Thābit (d.150/767), one of the greatest pioneers of Islamic jurisprudence. The author, Mohammad Akram Nadwi, investigates why and how the Imam came to be known by the title, `al-imām al-a'ẓam', meaning the `the greatest one worthy to be followed'. The reason he decided to produce this work is due to the time in which we live, where people (Muslim and non-Muslim) are calling for reform of Islamic ways of life. 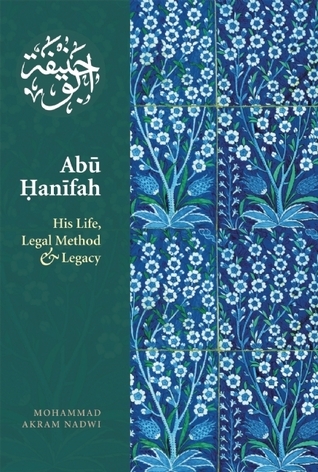 Hence you find here an account of the life and legal method of Imam Abū Ḥanīfah to portray "a sense of what kind of Muslim one should look to as a trustworthy source for understanding, adapting, amending the legal foundations of an Islamic way of life", p.xi. It is a study about the kind of man Imam Abū Ḥanīfah was, who he studied with, where he studied, how he lived his life, his interactions with other people and his life in relation with God and the School which he helped develop.The first chapter begins with the background to the earliest development of the law. What are its sources? How was it derived? Why was it required? How was it applied and implemented? In a vast growing and culturally diverse religion which at the time was spreading rapidly through the world, the law was an important factor in administering the rule of Islam for Muslims and non-Muslims alike. The first chapter offers a well written direct approach to this subject and you come away with a better perspective of the conditions of the time and the emergence and role of the scholars as jurists. It is essential to grasp the origins of the development of the law to enable a better understanding of the life of Imam Abū Ḥanīfah as well as other jurists of the time. The book does a good job in giving you this insight, though a detailed study is out of the question for a short work, nonetheless the brief explanation is a fine prologue to the development and background of the time.The second chapter focuses on the life of Imam Abū Ḥanīfah, his name, his ancestry, and his early education, his training in fiqh, his teachers and his relations with the state, leading to his eventual imprisonment for refusing the post of qāḍī (judge) and his death. It is a good overview which takes in to account all the important milestones in his life. The author closes the chapter by observing his livelihood and personal qualities. The generosity and piety of Imam Abū Ḥanīfah leaves you in awe of him. There are not many men in whom you will find humbleness and patience to the extent in which you find them in Imam Abū Ḥanīfah. You can't help but admire, not only his financial aid to the poor but his method in delivering this assistance i.e. on one occasion when visitors rose to take their leave, he asked the poor from among them to stay on and after they had gone he asked them to lift the prayer mat where lay a purse containing a thousand dirhams. There are many examples of the kindness of Imam Abū Ḥanīfah and the credit he was to his people, something we can all adapt in to our lives.Aside from his God-wariness, he was a blessed witty genius, an intellectual mastermind and an exceptional jurist. This is explored in the following chapters entitled "his fiqh" and "his works and students". The author gives you a quick outline of the origins of "The Kufan School of Fiqh" so that one can obtain an understanding of where the Kufan School which Imam Abū Ḥanīfah inherited finds its primacy and source. I'm sure some are probably not aware that more Companions settled in Kufah than in any other city except Makkah and Medinah. It is reported that over one thousand Companions, including twenty-four from the Battle of Badr came to Kufah and settled there permanently. The most influential, especially in terms of developing fiqh, were `Abdullāh ibn Mas'ūd and `Alī ibn Abī Ṭālib, men of the highest precedence in Islam. Imam Abū Ḥanīfah himself narrated hadith from an estimated three-hundred teachers, among many whom narrated directly from the Companions, for example, Amir al-Sha'bi' (d.104), his oldest teacher met around five-hundred Companions.The simplicity employed by the author makes it easy to follow the historical outline. It is not detailed but that is its intention, the balance for such a work in my opinion is perfect. The majority of this chapter focuses on the method, sources and principles of Imam Abū Ḥanīfah in developing the fiqh of Kufah which eventually bore his name as the Ḥanafī School. It is very well written, though one ought to have some familiarity with the other leading scholars of the time (Mālik, Layth ibn Sā'd, al-Awzā'ī, Sufyān al-Thawrī and others) as well as those that came after him (ash-Shafī'ī, Ahmad ibn Hanbāl, al-Bukhārī and others) though it isn't essential to know this to follow the authors comparisons it is beneficial for the historical context. That aside, I haven't come across a more simplified summation of the method, sources and rules of law utilised by Imam Abū Ḥanīfah than in this work.The final chapter is entitled "his achievement and his legacy". The author provides an overview of the fiqh of Imam Abū Ḥanīfah and then follows it with a really good historical narrative on the spread of the Ḥanafī School in the Islamic world and the development of the fiqh works of the School as well as its principles. I found it very helpful. The author brings this to a close by reminding the audience that to truly preserve the heritage, it is important to remember the rulings by observing the purpose for which they were made i.e. in a custody ruling the purpose was the benefit of the child and not the ruling itself. And since the benefit could lay with either parent depending on their circumstances, it is necessary to be flexible and this does not endanger the authenticity of the legal heritage of Islam as this was the method and practice of Imam Abū Ḥanīfah which he exercised within the framework of the Qur'an and Sunnah. The author concludes by stating, "Abū Ḥanīfah spent a lifetime schooling his heart and mind to interpret Qur'an and Sunnah in order to serve the needs of society of his time. Reliable people have testified that he often spent his nights in prayer, trembling for fear of God's displeasure... That earned him the admiration of people and the title 'al-imām al-a'ẓam'... The Muslims' debt to him, whatever school of law they adhere to, is incalculable." (p.120)Overall, this is a fine book and makes for an excellent introduction to the erudite, pious, intellectual genius that is Imam Abū Ḥanīfah. The author has done a really good job in keeping the work interesting without compromising detail. It is worth more than a single read and is a good foundational text to the life of Imam Abū Ḥanīfah. If you want to learn about him, I would suggest you start with this work. The Prophet Muhammad (ṣallā Allāhu ʿalayhi wasallam) said, "Scholars are the inheritors of the Prophets" [Related by Tirmidhi, Abu Dawud, Nasa'i, Ibn Maja, Ahmad, Ibn Hibban, and others] and this fact is reflected in Imam Abū Ḥanīfah, may God be pleased with him. Dr Muhammad Akram Nadwi menjelaskan beberapa salah faham terhadap Al-Imām al-A‘ẓam Abū Ḥanīfah raḥimahu l-Lāh dan fiqh beliau.